Acclaimed cookbook author Jessica B. Harris has spent much of her life researching the food and foodways of the African Diaspora. "High on the Hog" is the culmination of years of her work, and the result is a most engaging history of African American cuisine. Harris takes the reader on a harrowing journey from Africa across the Atlantic to America, tracking the trials that the people and the food have undergone along the way. From chitlins and ham hocks to fried chicken and vegan soul, Harris celebrates the delicious and restorative foods of the African American experience and details how each came to form such an important part of African American culture, history, and identity. 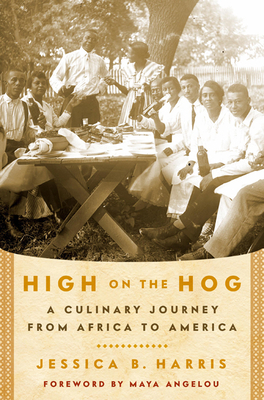 Although the story of African cuisine in America begins with slavery, "High on the Hog" ultimately chronicles a thrilling history of triumph and survival. The work of a masterful storyteller and an acclaimed scholar, Jessica B. Harris's "High on the Hog" fills an important gap in our culinary history. Praise for Jessica B. Harris: "Jessica Harris masters the ability to both educate and inspire the reader in a fascinating new way." -Marcus Samuelsson, chef owner of Restaurant Aquavit. Jessica Harris is the bestselling author of "The Welcome Table," "Sky Juice and Flying Fish, " "Beyond Gumbo," and "Iron Pots & Wooden Spoons," among many others. Her work has appeared in "Essence," "Gourmet," "Food & Wine," "Cooking Light," and "Eating Well." She is a contributor to food website zesterdaily.com and "Saveur." Harris is a professor of English in New York City and scholar-in-residence in the Ray Charles Chair in African-American Culture, at Dillard University in New Orleans.